PHOENIX, NY – Virginia (Terramijji) Albino, 94, passed peacefully into the arms of her Lord, and the arms of her children, at the Loretto Cunningham care facility on Saturday January 3, 2015. She was a former Woodbine Avenue, Syracuse, NY, resident. A life-long hairstylist, she engaged her craft. Virginia enjoyed her weekly Thursday bus trips to the Turning Stone Casino, Verona. She loved watching Tiger Woods and was a devout fan of all Syracuse University sports. She was born on January 12, 1920, in Fulton NY, to her late parents, Antonette (Perichino) and John Terramijji. She is also predeceased by her three children, Mike Novak in December 2014, John Novak in November 2014 and Katherine Geswaldo in March of 1988; a daughter-in-law, Kathleen (Milligan) Novak in May of 2008; two grandchildren, Charles “Chucky” Novak and Joseph Geswaldo. 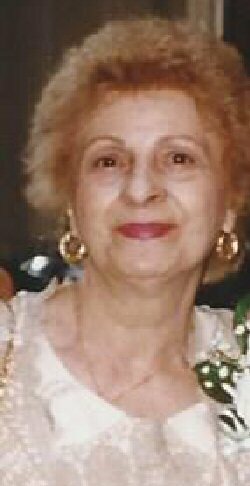 Surviving are her daughter-in-law, Gloria Novak; her son-in-law, Louis Geswaldo Sr.; nine grandchildren; 16 great-grandchildren. A Catholic Mass will be held at 9:30 a.m. on Friday at St. Stephen’s Church, 469 Main St., Phoenix, with the Rev. Philip Brockmyre officiating. The burial immediately following in Assumption Cemetery, 2401 Court St., Syracuse. There are no calling hours per Virginia’s wishes. In lieu of flowers, memorials to: St. Joseph’s Hospital, 301 Prospect Ave., Syracuse, 13203. Allanson-Glanville-Tappan Funeral Home, Phoenix, has charge of arrangements.